Which route to choose for the Mount Elbrus climb? Time to time there is discussions which route to choose to climb Mt Elbrus – southern or northern. Putting together different situations from my many years guiding experience and from experience of other guides I result my opinion on this subject below. Advantage the Elbrus Northern side and route has is that it is wilder and not that much spoiled. It is quite strong advantage and for many people it can be only argument choosing the route. -south side you will have fantastic views of the Caucasian Main Range with tens of peaks over 4000m, every day during acclimatisation walks as well as during the Elbrus climb. 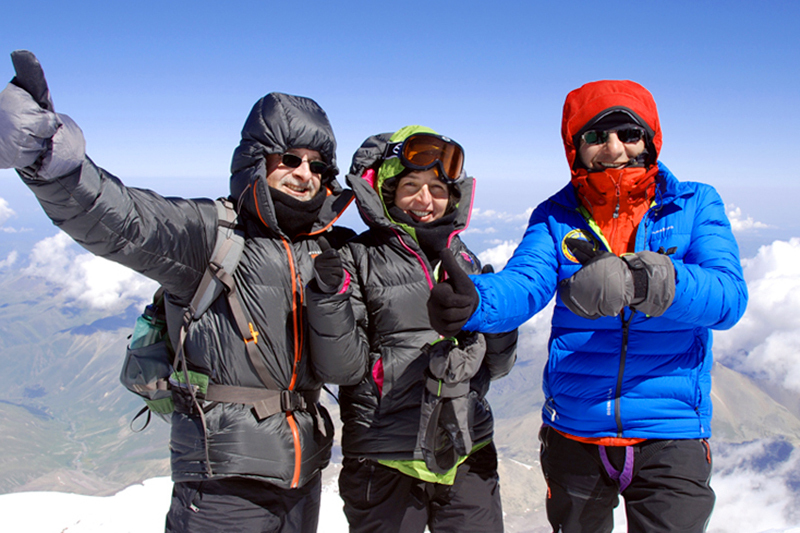 On northern side Mt Elbrus covers that perfect views and you can have it just from the top of Elbrus – if you are lucky and it is clear exactly at that moment. -south side you can climb different peaks during acclimatisation and visit different beautiful valleys and glaciers. From northern side you stay actually on the Mt Elbrus slopes only and do acclimatisation walking almost the same slopes several times. -southern side there is good reception at the mountain huts, can get updated weather forecast 2-3 times a day and choose the best day for the climb. On northern side there is no connection at all and can’t get updated weather forecast. -climbing route from south is marked with sticks what helps very much to find way in case of bad weather conditions (most of accidents on Elbrus happens due to bad weather – climbers lost way and get frozen or fall into crevasses). There are some sticks on the northern route but too far from each other and in bad weather are not useful. Yes, GPS is helpful but I would not recommend fully trust just GPS. -On the climbing route itself there are not crevasses on southern route. On the northern route there is a big section with crevasses. If there are experienced climbing friend in the group or you are with guide it is not a problem. But if the group splits in few sections and there are not enough guides in the group the climbing will get unsafe. -if something is wrong during the climbing and it is necessary to get down in the valley or to the hospital quickly, one can do it in couple of hours on southern using snow mobile and ski lifts. From northern slopes it is necessary to walk 8-10 hrs to get to a car and drive few more hours to the hospital. But if you can not walk…? If you are lucky and managed to contact rescues (there is communication problem in the area) quickest they can come up to 5000m (or higher) is 3-4 hrs. They will need 4-5 hrs to take down suffered person to the road and then another few hours to the hospital. -on southern slopes there are many mountain huts and in stormy weather you can wait for the better conditions at the huts. On northern slopes there are couple of small cabins. In summer climbing season it is really difficult to get rooms there and many people stay at the tents. And if stormy weather continues 2-3 days it is not easy to fight during those days against wind, cold and wet accommodating in the tents. As result most of people give up the climbing after 2-3 stormy days in the tents. -on south side you can buy bottled water to drink. On north side only option is to drink stream water, boil it before or use purifying tablets. Boiling of 3-4 l water (or even more) per person each day can be not real (especially for big groups). And eat purifying tablets during 8-9 days is not the best you can do. So, if your main goal is to be in more wild area and climbing to the top of Elbrus is just an addition to that - northern route is an option. But if your main target is successful and safe climb to the top - southern route is better. Hope in the near future things will change on north side (at least will have unlimited clean water availability, stable connection and permanent shower) and conditions can get better for safer and pleasant climb. But at the current conditions I vote for the south route.